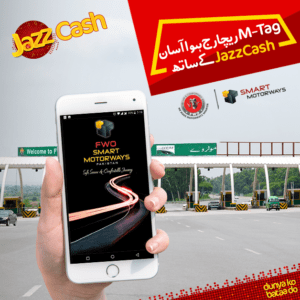 JazzCash introduced a perfect Motorway M-tag Recharge service in the collaboration of FWO. This solution is introduced for M-2 Motorway travelers. The purpose of this is to digitalize the travel across the country through Lahore-Islamabad Motorway. Before that, the customer has to take some stay at FWO plazas for Motorway M-tag Recharge. Jazz introduces an efficient way of getting the M-Tag online. This Motorway M-Tag Recharge has reduced the hectic and provide a hassle-free method. The Jazzcash customer with the following mediums can tap up for this great and amazing service. First of all, you can avail this service by Retailer’s network of JazzCash. Moreover, you can also grab this by or FOW website (debit or credit card). Go to the original site of the motorway and you must have a JazzCash account. Lastly, JazzCash mobile accounts alongside with motorway application. The procedure of this varies according to medium. Choose the best medium and follow the procedure accordingly. When you have a JazzCash account, you have to follow this procedure which is very easy. But make sure that, you have a JazzCash account with USSD menu. Firstly, for M-Tag recharge, simply dial *786# from your mobile. Then, in menu selection select the number 5 which is Payment from the menu. Another menu will be displayed, select the number 4 from the menu which is M-tag. Now, enter the valid M-Tag id and recharge the desired amount. After that, you have to enter MPIN number in a window. Lastly, you will receive a confirmation message shortly. First of all, visit the nearest retailer shop. The retailer will dial *786# from your mobile and future perform all the method. Now, you will receive a message from the company which will include the MPIN and amount details. Remember, the retailer will be received a commission of 20 PKR from your every recharge. Firstly, visit the FWO official website for recharge. Now, select the M-Tag Recharge from the menu of the site. Then, enter your M-Tag ID and the amount you want to recharge. Remember, you can get the M-tag ID just by sending the CNIC number and send it to 9909. Here, the customer has to select the payment method via JazzCash account or credit/debit account. In case of JazzCash account for payment customer enters the mobile account number. The popup window will appear to enter the MPIN. If the customer selected the credit/debit, they have to enter a number, expiry, CCV, and phone number. Submit it and that’s it.